Update late 2018: Watching Argento’s film again in light of the remake, I’m struck by how thoroughly anti-psychological Suspiria is, and how seriously it suggests a more mid-to-late-century continental, European perspective of wider social-structural reality rather than, say, American horror cinema’s (or earlier European cinema’s) frequent equation of maturity with internal, individual psychology. Which is to say, while many viewers legitimize horror through a frame of psychological modernism – the ability to peer beneath a layer of reality to expose the psychological warp and weave of experience in the mind of one figure who doesn’t see the world as we do, or as according to some ultimate and inescapable “truth” – Suspiria almost never imagines horror as something from within. Unlike, say, Rosemary’s Baby, it only seldom plays on the often enlightening but sometimes rote, automatic, manufactured “ambiguity” which validates horror from without by reminding us how it might be horror from within, a perspective which thereby resolves the terror of the knowable world by ensconcing the film in the mind of one person who is implicitly figured as delusory, an unreliable perspective on what would be an objective reality outside their mind. This perspective, wonderful though it can be, is often timid when it comes to more fundamental interrogations of social reality; it allows a film to preserve a “real” truth that one character simply may not be able to see, couching itself in a kind of medicinal American individualism which sees reality as either objectively true at a macro level or completely manipulable at the level of individual mind; the world effuses from within, and conflict is ultimately a question about how to reconcile individual creativity and perspective with the structural violence of society, often figured as limiting to individual consciousness rather than constitutive to it. Suspiria, frankly, seems to resist any such ideological safeguards; it seems to be ontologically and epistemologically decomposing regardless of who is on-screen or whose “perspective” we are being granted. It oblique maneuvers intimate not a glimpse into one character’s warped mind but a flickering vision of a more fundamentally unstable reality, a world where occult speculations dance with modern materialism and problematize any resources – including the “it’s all in her head” frame I allude to above – we might dress the film up in so as to contain it. Argento, in this sense, is a more singular creature, and Suspiria a truly untamed beast in the annals of modern horror cinema. It only seemed appropriate to open the post-Halloween month with a review of one of my absolute favorite horror films. When I initially chose the four films to cover for my exploration of Italian cinema (as I choose to call my attempt to really just put up more reviews in the early stages of my writing loosely wrapped around some semblance of a theme), I concentrated primarily on the esteemed classics. And indeed, the Italian neo-realist movement in the late ’40s and the new wave in the late ’50s and ’60s (populated by the likes of Fellini and Antonioni) are two of the most densely-packed periods of filmic invention ever. But then I realized something … the cinema of a nation isn’t defined by its most traditional paragons of greatness, but by all the films it produced, including its genre films. And few nations have produced more genre films than Italy, especially during the ’60s (Spaghetti Westerns) and the ’70s (giallo horror). Having already published a review of my absolute favorite Italian Western, Once Upon a Time in the West, I decided to return to my bread-and-butter, horror, to kick-start the month with some blood-red pizzaz. And if I was going to do Italian, it needed to be giallo. No, it needed to be THE giallo, a B-picture that not only defies conceptions of artistic veracity but recreates them to its own liking. Ladies and gentlemen, Dario Argento’s Suspiria. This entry was posted in National Cinemas, Review and tagged cinematic deconstruction, dario argento, exploitation-as-art, horror films, italian cinema, Score: 10/10, that cinematography though on November 2, 2014 by jakewalters98. Update 2018: With all the news about the retail apocalypse, swamping America these days, it’s both curiously innocent and deceptively terrifying to return to Romero’s Dawn of the Dead as a vision of life after death where our consumer habits mark us as prematurely deceased in life anyway. In this film, the suburban consumer hub where we metaphorically (and literally) armor ourselves against assault from our zombified negative mirror-images also become our collective coffin. Because in life and death we can only think to shop, our protective shell becomes an iron maiden, America’s multi-story beacon of convenient commercialization and mid-century superiority curdled into a national self-cleaning oven. Also, watching again, the film’s broad-side critique of masculine America’s preferred outlet for social critique during the ’70s – anti-social biker gangs choosing self-aggrandizing, mythic displacement and libertarian idealism over serious collective organizing – is all the more pressing today. Romero reads Easy Rider not simply as a hopeless quest for sanctity and a perpetual deferral of home in light of the dethroned classical nuclear family structure but a caricature of “rebellion,” an attempt by men to reinstate new social structures in ways which incline toward the brutishly male, the individualistically chaotic, and often – insofar as biker gangs and Neo-Nazis have a historical connection – the truly oppressive. I wasn’t originally going to review two Romero films in the American New Wave series, but ’tis the season, and a horror review for the week of Halloween seemed only humane of me. This entry was posted in American New Wave, Review and tagged American New Wave, exploitation-as-art, George Romero, horror films, Score: 10/10, Zombies! on October 27, 2014 by jakewalters98. This post being in honor of the film’s fortieth anniversary this upcoming Wednesday, October 1. Here’s to forty more years of soul-deadening terror. The story of five nobodies wandering through rural Texas and running afoul of America’s hidden secrets, The Texas Chainsaw Massacre is infamously violent, which is curious because it’s hardly violent at all. The body-count is shockingly low and deaths happen mostly off-screen, relegated to the abyssal margins of an already poetically empty screen space, one which seemingly voids participation in a wider social milieu. But if the movie feels violent more than it is violent, that’s because it feels positively disgusting. This is grimy, disturbing filmmaking in every possible way, almost toxically fugitive in its disobedience to propriety. It may be one of the grossest-looking famous movies ever released, somehow both punishingly direct and monstrously, mystifyingly oblique, like it’s showing us everything head-on while veiling more submerged truths about American discontent. The film grain, even for the time, is knowingly poor – it feels like a documentary more than a film, lending it an unsettling and grimy immediacy, but also an evasive sense of ambiguity. The film-grain scratches which are testament to the authenticity of its expression of reality also suggest the film’s curiosity about a reality that is ultimately inexpressible, a sense of horror which is both extremely forthright – sometimes breaking through the film screen itself to confront us head-on – and obliquely suggestive of terrors we aren’t, and perhaps can’t be, privy to. This entry was posted in American New Wave, Review and tagged American New Wave, american nightmares, exploitation-as-art, horror films, Score: 10/10 on September 28, 2014 by jakewalters98. This entry was posted in Genre Months, Review and tagged anti-genre, Confrontational Classics, contempt for humanity, exploitation-as-art, film noir, noirish, Score: 10/10, subversive violence on September 11, 2014 by jakewalters98. 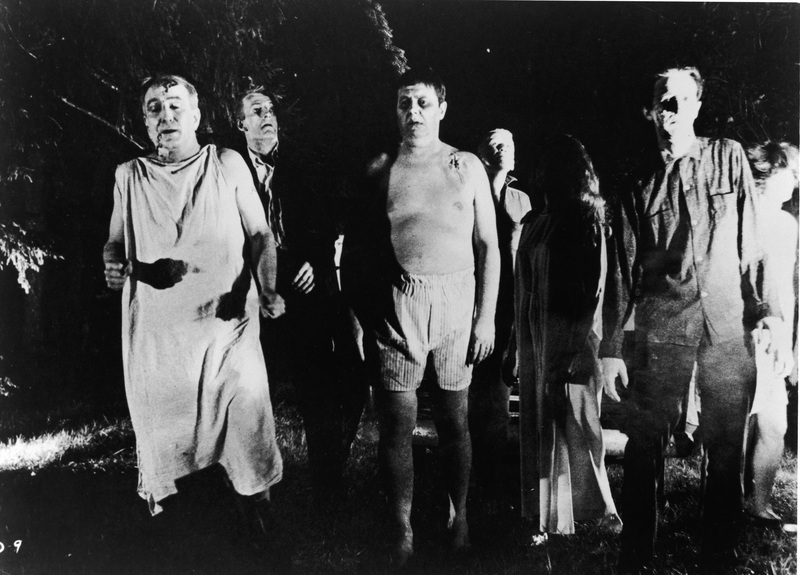 Armed with a 114,000 dollar budget, a few low-quality cameras, a non-professional cast, and its hopes and dreams (not to mention its fair share of nightmares), George A. Romero’s 1968 game-changer Night of the Living Dead wouldn’t seem an “ambitious” project on the surface. Or even one destined for competence. And that’s exactly why it’s so thrillingly disconcerting. It has, and needs, only one ambition: to scare. It eschews any hope of middlebrow competence. And due to its lean, mean, guerrilla filmmaking and single-minded obsessiveness, it doesn’t just scare – it instills a creeping, gnawing fear and doesn’t let up. Night of the Living Dead is, famously, about as economical as a film can be, with no shots wasted and nothing left up to chance – it’s a study in efficiency, but it’s more than that. It’s a study in terror. This entry was posted in American New Wave, Review and tagged American New Wave, exploitation-as-art, films that changed everything, George Romero, race in film, Score: 10/10, Slavery, Zombies! on August 13, 2014 by jakewalters98.